This Bitcoin Pizza Day, Remember Not to Spend Bitcoins on Pizza. Cryptocurrency enthusiasts everywhere set aside May 22 to celebrate the anniversary of the first ever Bitcoin transaction: Two pizzas for 10,000 coins bought exactly eight years ago. If you stacked the pizza boxes you can get for that many Bitcoins today, they’d rise to outer space. At today’s price near $8,200 per Bitcoin, you could get about 6.5 million $12.50 pizzas. If you stacked those pizza boxes, they’d climb almost 200 miles (300 kilometers) into the air, according to data from Forex Time, a foreign exchange broker. Its animated infographic marks the landmarks crossed by the boxes -- Dubai’s Burj Khalifa, Mount Everest, a passenger airplane -- before shooting into space. Bitcoin isn’t quite getting to the moon, but close. As Bitcoin’s value soared over the years, the developer who made the initial purchase, Laszlo Hanyecz, became a legend in the crypto space and beyond. He’ll forever be known as the guy who forked over assets now valued at $82 million, for pizza. Earlier this year Hanyecz replicated his move using the Lightning Network, a technology that runs parallel to Bitcoin’s blockchain and aims to speed up transactions. 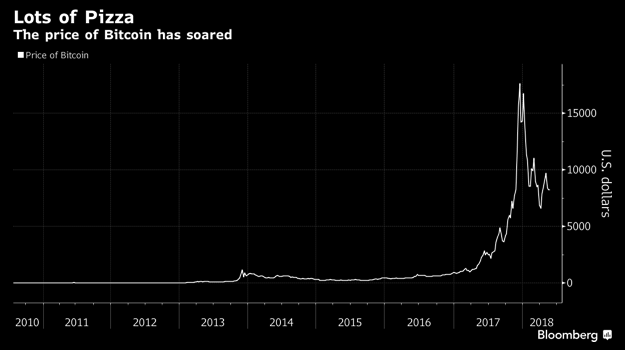 Bitcoin Pizza Day has become a reminder of how much the coin’s price has skyrocketed even after the slump from the record of almost $20,000 last year. The largest cryptocurrency was worth pennies at the time of the first pizza purchase.